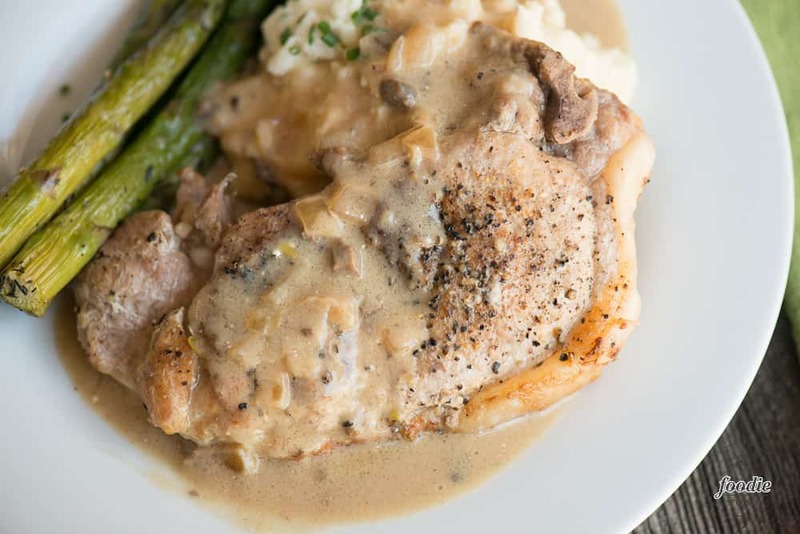 Instant Pot Smothered Pork Chops are a quick and easy dinner option that your family will love. Super moist bone-in pork chops are seared and then pressure cooked to perfection. 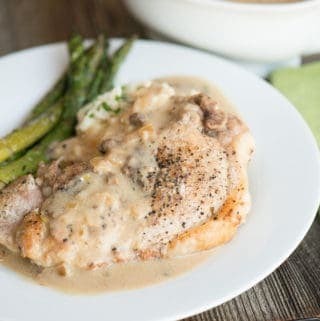 A quick and easy creamy mushroom gravy comes together at the end to add even more flavor and moisture to the pork chops! 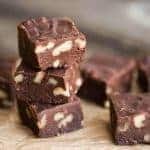 Pin it to your INSTANT POT RECIPE BOARD to SAVE it for later! 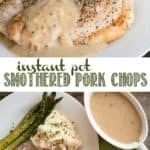 Instant Pot Smothered Pork Chops are a great option if you’re looking for delicious pressure cooker recipes. If you’re a fan of pork chops, I’ll post my favorite pork chop recipes below. Likewise, if you love cooking dinner in the Instant Pot, I’ll post some of my favorites below too. How do you make gravy for pork chops? 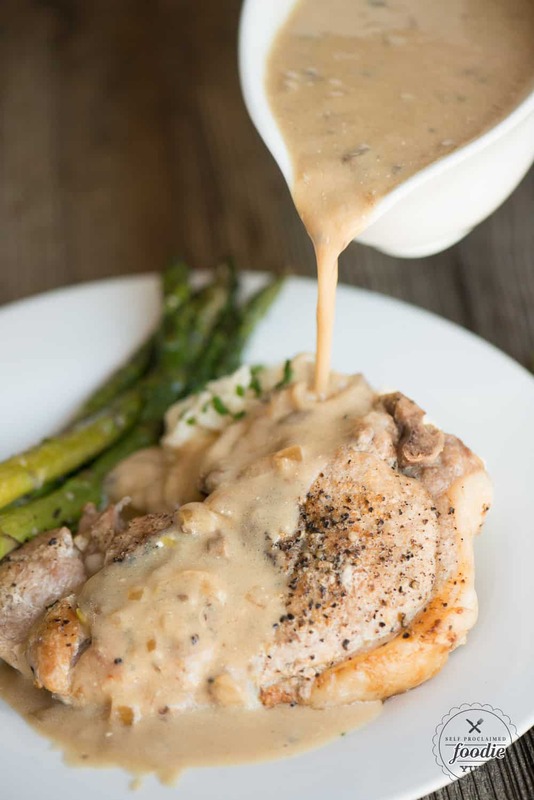 The best part about making smothered pork chops is that the gravy is part of the meal! Not only sauce the sauce keep the pork extra moist, but you can continue to smother it after it’s plated. For this particular recipe, my gravy is a mixture of onion, chicken broth, cream of mushroom soup, and sour cream. I am quite particular with the type of cream of mushroom soup that I use and love the kind Trader Joe’s offers. I’m a big fan of mashed potatoes. Two of my favorite mashed potato recipes are my Gorgonzola Celery Root Mashed Potatoes and my Roasted Garlic Mashed Potatoes. Prefer sweet potatoes instead? You might want to try making my Mashed Sweet Potatoes recipe. You can’t go wrong with a perfectly cooked baked potato. Like, ever. You’ll never make them any other way once you make my Pressure Cooker (Instant Pot) Baked Potatoes. You always need some kind of green veggie on your dinner plate! Here are some of my favorite options: Bacon Wrapped Asparagus, Perfect Garlic Sauteed Asparagus, Wilted Garlic Spinach, and Roasted Brussels Sprouts Salad. Instant Pot Smothered Pork Chops are a quick and easy dinner option that your family will love. Super moist bone-in pork chops are seared and then pressure cooked to perfection. 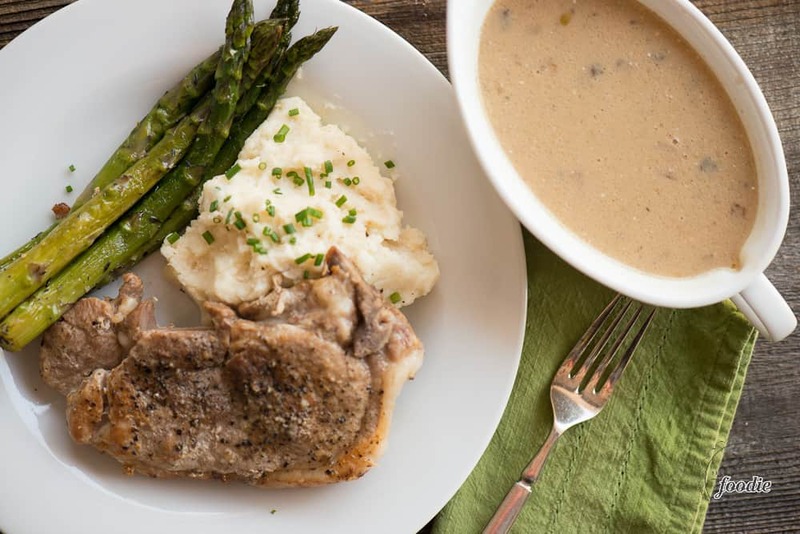 A quick and easy creamy mushroom gravy comes together at the end to add even more flavor and moisture to the pork chops! Rinse and pat dry pork chops. Add salt and pepper to both sides. Set pressure cooker to saute or browning setting. Add olive oil to cooking pot. When hot, add pork chops and allow to sear for a couple minutes on both sides. Remove pork chops, transfer to plate, add rack to pressure cooker. Add onions, chicken broth, and pork chops along with any juices back to cooking pot. Seal lid and cook on high pressure for 8 minutes. 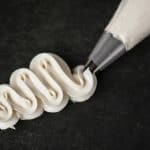 Allow pressure to naturally release for about 10 minutes and then quick release remaining pressure. Remove cooked pork chops and transfer to a clean plate. Add cream of mushroom and sour cream to cooking pot and stir to combine and heat through. Serve pork chops with warm mushroom gravy. 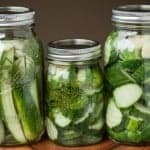 What would be the best way you would cook the chops if you dint have a Insta pot? Hi Val, The way I did it was remove the browned pork chops, put the rack in, and then everything back in. The broth goes to the bottom but the pork chops and most of the onions sit on top. No idea if that’s really necessary, but that’s how I did it and the result was really good! 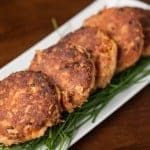 Can you fix more than 2 pork chops using this recipe,as i have a family of four? Yes! As long as your Instant Pot is big enough. How do I adjust the time for 6 pork chops? Hi Jessica, If it were me, I would increase the time from like 8min to 12min. Once you open the lid, be sure to stick one with a thermometer and make sure it reads at least 145F. If it doesn’t, I would close the lid and cook for a few more minutes. If I want extra gravy should I double the soup, broth, and sour cream? Thanks. Yep! You can totally make extra gravy that way! I only have one can of cream of mushroom. Has anybody ever used half cream of celery or cream of chicken with it?